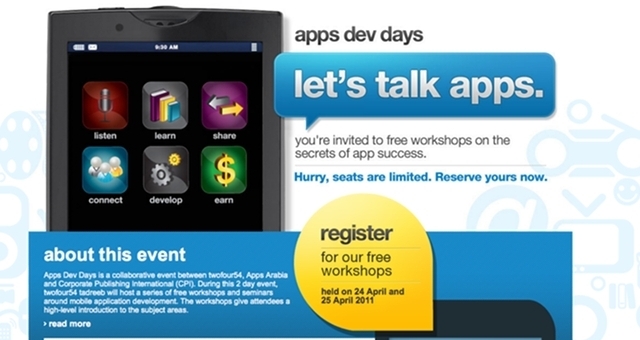 A free event Apps Dev Days open for all to attend about developing mobile applications and considering designing apps for mobile. It is a collaborative event between twofour54, Apps Arabia and Corporate Publishing International (CPI). The event will be held on April 24 – 25 in Abu Dhabi in twofour54’s headquarters, tadreeb which is a part of twofour54 will host a series of free workshops and seminars around mobile application development. The first day will focus on user centered designs of apps where the focus will be on improving the user interface and developing experiences around the user’s needs. That means coming up with something useful and practical yet still not compromising on the looks and aesthetics of the app. The sessions above will be given by highly qualified that have vast experiences in the digital and mobile industry. You can register for the event here, but hurry because from the looks of it registrations are filling up quick.